One of the most effective attachments for Farrier Use on bench grinders is the expander wheel. 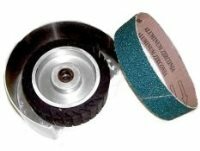 The wheel does not have any “tension adjustment” similar to a traditional belt sander and that makes fit of belts a significant challenge. The wheels are designed to expand, a result of the slots cut in the rubber wheel. However, getting a belt fit that allows the belt to be easily installed or removed and still tighten sufficiently in use is difficult. Any slight change in the length of the belt can either make the fit looser or tighter. It was found that there were many more problems as a result of loose belts so we chose to have the belt manufacturers target a length that can be very tight, taking into consideration that they have tolerances in production of belts that can have enough variation to cause changes in the fit. This proved to reduce the risk of the belt sliding on start-up or in use, but also made installation and removal more tedious.